from the nether world, by the will of the LORD. and easily broke their power into pieces. You brought down nobles, from their beds of sickness. and a prophet as your successor. but after death our name will not be such. O Elijah, enveloped in the whirlwind! wrought many marvels by his mere word. nor was any man able to intimidate his will. beneath him flesh was brought back into life. and after death, marvelous deeds. all gods are prostrate before him. We all know the words to The Lord’s Prayer. They are the familiar, comforting words of our youth, or even, maybe, a movie scene. We can come from a myriad of Christian traditions and yet this prayer is a common thread between us, it is a key and important part of what it means to be a Christian—that we pray the way Christ Himself instructed us. But if we truly pray these words we are not simply going through pious motions and mouthing words of simple comfort. We’re declaring a daring and radical personal statement of belief and a manifesto on how we live our lives. I can’t help but get a tingle down my spine, and a little thrill of excitement when we recite the words “Give us this day our daily bread.” Those words do not simply mean “please give us what we want, when we want it” they mean that we rely on the Father to give us everything from day to day. Can we imagine what God might give us? “Thy Kingdom come, thy will be done” is an extreme thing to say when we don’t know what God’s will can mean for our lives. We choose to live with an incredible amount of surrender and trust when we pray these words. When we pray these words with our whole hearts, minds, and wills we are opening our lives to whatever God may have in store for us. It could mean being taken into heaven in a fiery chariot like Elijah in today’s First Reading, it could mean laying down our own desires for what God may be calling us to, it could mean being bold and daring and going where we never thought we could, it could mean accepting terrible suffering, it could mean just about anything. That is a very daring action to pray these words, it is not a passive or meaningless prayer. It takes a lot of trust to live each day in the present moment waiting for God’s word in our lives, waiting for what we are in desperately in need of, or waiting for the strength to get through immense challenges. 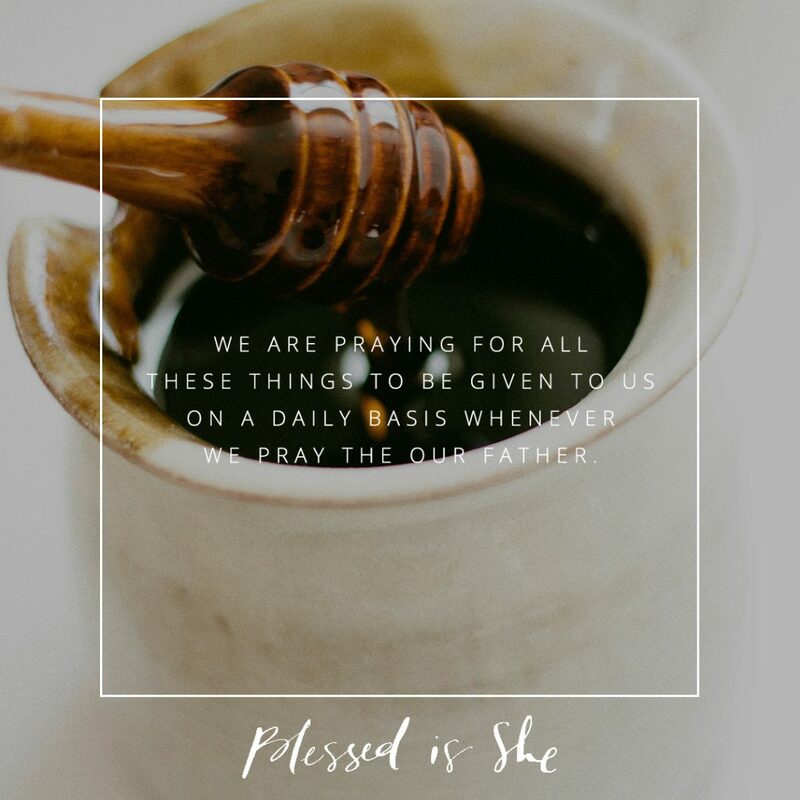 Although our daily lives may feel staid with sameness and overwhelmed in the ordinary, the truth we live as Christians is exemplified in this prayer of Christ’s. We offer ourselves and our lives to God and we know that any day momentous things could happen and that grace comes without fail. When we pray the Our Father, we’re declaring a daring & radical personal statement of belief. Christ has taught us a powerful prayer for changing our lives in accordance to His grace, pray the Our Father today while imaging the words coming from the voice of Christ, and let His grace touch your life. Christy Isinger is the mom to five lovely, loud children living in the Canadian wilds. You can find out more about her here. Next Post What's Your Darkness?